Pittsburgh-born dancer and choreographer Kyle Abraham is going places -- and performing here this week. Photo courtesy of Steven Schreiber. Talking with dancer and choreographer Kyle Abraham, you get the impression he is on the verge of something big. And he just might be. The 31-year-old Pittsburgh native, who splits his time between the Steel City and the Big Apple, maintains a frenzied lifestyle dancing and touring full time with New York-based David Dorfman Dance while running, choreographing and performing for Abraham.in.Motion, the dance company he founded in 2005. The expanding schedule fosters growing acclaim. 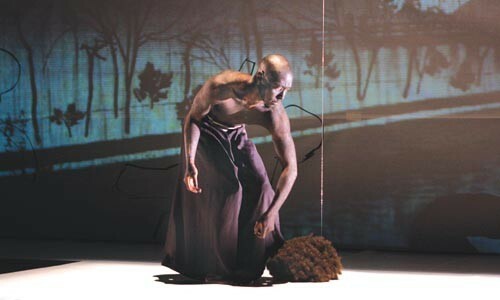 Recently, Abraham and company received a glowing review in The New York Times; this month, Dance Magazine put him on its prestigious "25 to Watch" for 2009. I caught up with Abraham via telephone from New York, where he and his company were busy preparing for a showcase at the annual Association for Performing Arts Presenters conference. He spoke about his company's residency, and a Jan. 24 performance, at the Kelly-Strayhorn Theater. "I was recently described as a hip-hop hybrid to Merce Cunningham," says Abraham, who grew up in Lincoln-Larimer and began his dance training at the Civic Light Opera Academy and Pittsburgh's High School for the Creative and Performing Arts. He adds, "I am a huge fan of Merce Cunningham's style of modern dance, but at the same time I am drawn to dance styles from opposite ends of the spectrum." Abraham's choreographic approach includes a hodgepodge of movement styles, embracing hip hop, modern dance and contemporary ballet. In his four-day residency at the Kelly-Strayhorn, Abraham and company will create The Radio Show (working title), a work-in-progress in which Abraham will cull excerpts of past works -- just as modern-dance master Cunningham used to do. But whereas Cunningham begins with movement and adds music later, Abraham says his process starts with a "mix-tape" of music, then proceeds to blending the compositions' corresponding movement phrases, some re-worked, to create a new dance piece. Abraham holds degrees in dance from SUNY Purchase and NYU's Tisch School of the Arts; his resume includes credits with Pittsburgh troupes Dance Alloy and Attack Theatre, plus Bill T. Jones/Arnie Zane Dance Company, nathan trice/RITUALS and the Kevin Wynn Collection. Much of his success in using varied styles of movement derives from his ability to make them mesh and flow almost undetectably. Set on himself and his young company (most of them colleagues from college), Abraham's choreography appears natural. 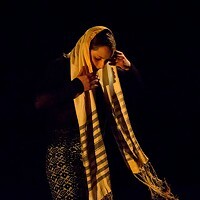 More overtly, Abraham's choreography is also very personal and often provocative in its subject matter, delving into themes of prejudice and sexuality. In his most recent group work -- the 32-minute "The Dripping Kind," which fills the remainder of the Jan. 24 program -- Abraham explores interpersonal relationships, both straight and gay, through falling. "I was inspired by the act of falling and falling down," says Abraham. "The work contains both literal and nonliteral interpretations of what it means to fall." Of "Dripping," New York Times dance critic Claudia La Rocco wrote recently: "The work's tense, lunging movement lingered in the mind's eye. Here were bodies rendered far more formally, yet still inseparable from their internal earthquakes of emotion and need." Whether he's taking on social issues or making ever bigger splashes on the local and national scenes, the sense that Abraham is on the verge of a breakthrough looms primarily because his talent is just too big to ignore. For area dance-lovers, the "something big" this weekend is another opportunity to see Abraham.in.Motion in action.